This weeks challenge at Just Add Ink courtesy of Paula is to Just Add Grunge…um well I actually had trouble with this challenge but then I had this lightbulb moment and my card was done in 15 minutes! 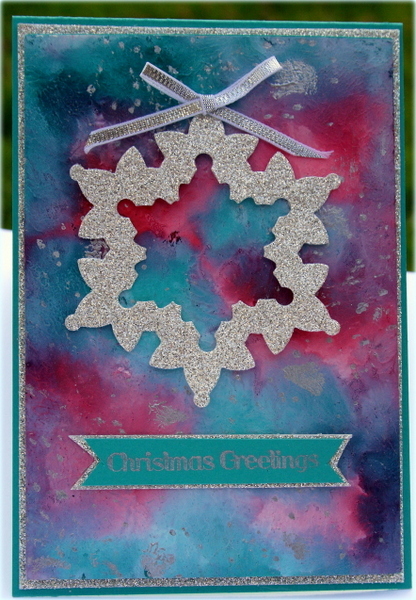 Love how this card turned out and reminds me of celestial night skys or the Northern Lights. This technique is called Gesso resist and is a lot of fun to do. Ive been teaching this technique in my scrapbooking classes lately and is a real wow and a lot of fun to do. My Daughter has already snaffled it for her friend for Christmas..might make some more up! The colours I used was Cherry cobbler, Primrose Petals and Bermuda Bay. 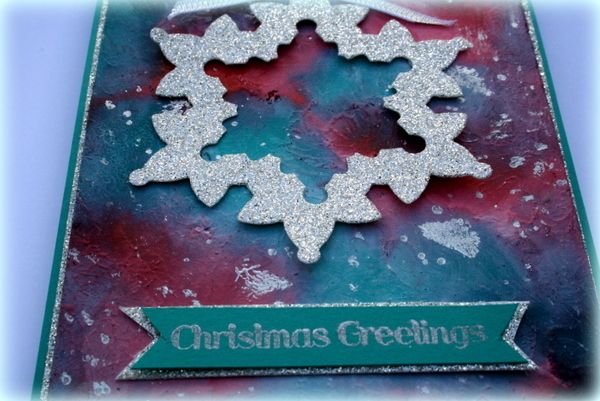 I stamped over the top with silver encore ink and the Gorgeous Grunge stamp set. The greeting is from a hostess set called Warmth and Wonder (Holiday Mini). So check out what the other girls on the Design Team have done here. What a cool card. I have never heard of this technique but it looks great. I will have to try it.